A Massachusetts judge ruled that Camille Cosby would not be deposed Wednesday in a defamation case brought by seven accusers against her husband, CNN reports. The Cosby matriarch’s deposition had been scheduled for Wednesday, but her legal team filed an emergency motion for a stay just days before she was set to make her statement. U.S. Magistrate Judge David H. Hennessy allowed Cosby’s motion for the stay. 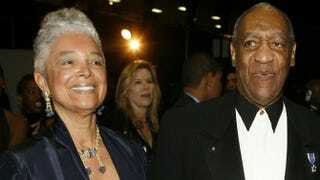 Because Camille Cosby will not be deposed at this time, she won’t be required to testify now in the defamation suit against her husband, whom she married when she was 19. But the 71-year-old isn’t completely out of the weeds—this stay only allows her more time to appeal the late-December order to be deposed by her husband’s accusers. A deposition could consist of her making a legal statement regarding her husband’s behavior patterns, details about lifestyle, and, potentially, conversations that she and her husband had over a period of time. The defamation case—which is a civil suit—was filed by seven (of more than 50) women who have accused Bill Cosby of drugging them and of sexual assault.